Around the holidays, Blue Suede Moo has become my local go-to Stilton impersonator. Like its famous British counterpart, it’s straw colored with beautiful indigo veining, densely packed beneath a cobblestone-like rind. One whiff, and you smell a burlap sack full of walnuts. One taste, and your mouth fills with toasty nuts and portobello mushrooms. The finish is like green branches on your tongue. This is a perfect winter cheese, excellent with port, preferably served fireside. Although it’s flavorful, it’s not particularly salty so you won’t mind reaching for seconds and thirds. 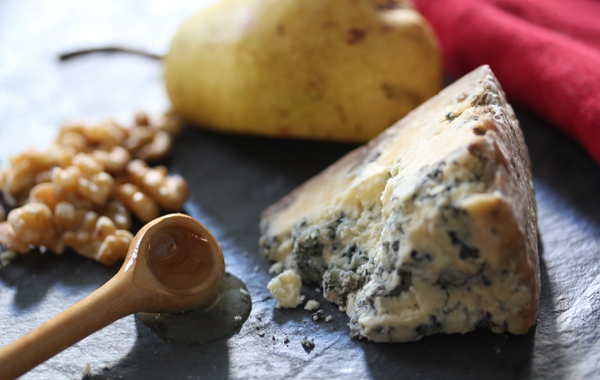 For an appetizer, toast Blue Suede aboard rustic bread with a few pear slices and walnut crumbles tucked underneath. A drizzle of local Urban Apiaries honey, post-toasting, makes this sublime. So does a quick crank of black pepper. Blue Suede Moo is made by Keswick Creamery in Newburg, Pa., where the Dietrich-Cochran family has farmed since the ’70s. They milk their own Jerseys and produce a variety of raw-milk cheeses with whimsical names, such as Dragon’s Breath and Wallaby. Like most farmstead cheesemakers, the Dietrich-Cochrans are incredibly devoted to their herd and don’t use any hormones or pesticides. What you taste is pure Cumberland Valley milk made by hand into wonderful British-style cheese. Like Elvis, it’s classic.